Noxii gladiators are again, not really true gladiators in the same sense as a murmillo or retarius gladiator. However these fighters were often criminals or prisoners of war, who offered little opportunity to become a skilled gladiator in another class. They were typically used in battle where they were not expected to win, almost cannon fodder for the more refined and skillful gladiators of ancient Rome. The noxii would have been used in various types of fights, or exhibitions in the amphitheatre. The noxii would fight in Sagittarius battles on foot, while the saggitarius would have the goal of trying to pick them off with a bow and arrow. Against an essadarius gladiator the noxii would be faced with a horse and chariot speeding towards them. The essadairus would try to run over, spear or trample the noxii. 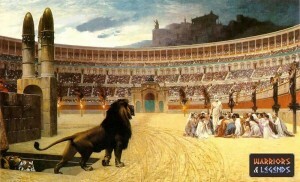 One of the worst cases for the noxii gladiators, here they would be pitted against animals of all species. Chances in these battles were very slim for the noxii. A group of noxii gladiators, a mix of criminals or war prisoners in the amphitheatre with some big cats. This was another bad situation for the noxii would would fight in andabatae battles. These were were multiple men were put into the arena, with limited or no visibility, leading to flailing weapons and one would think some rather comedic things going on, while still being incredibly violent and brutal! It’s very hard to accurately state what the noxii gladiators were armed with. At the least a weapon of some sort would have been provided to them, likely a gladius sword or a pugio of some sort. With either of these weapons the noxii would have been able to mount some sort of offence on their more skilled or famed foes. It’s likely the noxii fought in many battles with very little or no armour, their low status as criminals would not provide them with much favour. In some battles the noxii were given helmets like in the andabatae battles but often as a way to hinder them more than help. Survival was the primary motivation for the noxii gladiator, but their fighting style would have depended on what unfortunate situation they were placed. In a sagittarius battle the goal would be to find cover and close the distance. Against the essadarius speed and agility might help them avoid the chariot tumbling towards them. In the bestarii battles i think courage and blind hope would be their greatest assets. A noxii gladiator being attacked by a wild cat in the arena. To be cast as a noxii gladiator was not a situation one would hope for. 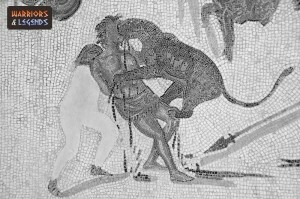 These fighters, unlikely considered true gladiators were not really expected to survive, but were more to satisfy the blood lust of the Roman empire and to keep the amphitheatre and its patrons happy.